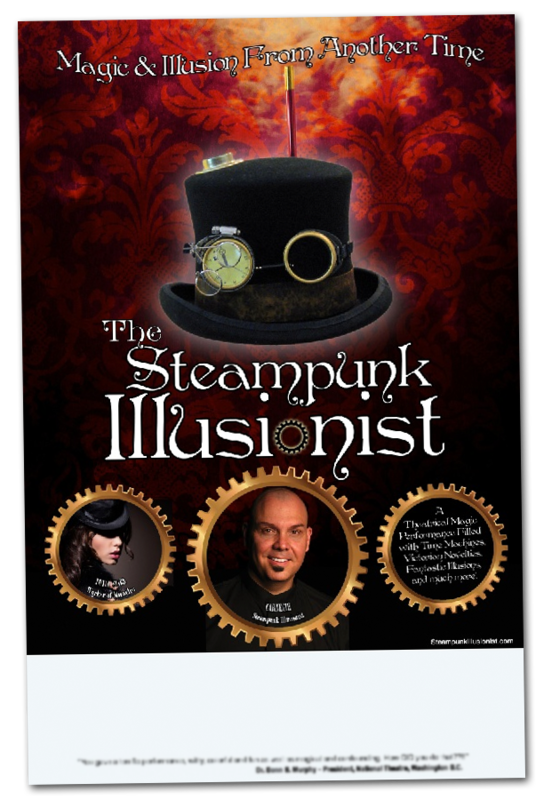 Right now, I'm working on producing a special ONE MAN version of my Steampunk Illusionist Show for Summer. I typically do around 100+ shows from end of June till end of August. Of those 100+ shows, about two dozen of the shows are this special one man show. And there are at least another dozen that are also steampunk but a different kind entirely. I'm very excited because it's the first time some of the updated Steampunk material will be in the show. One of the highlights will be a special 170 year old animal automaton. A real mechanical creature made of wires and springs and gears and cogs that will be used to locate a selected playing card! This is my ode to Robert-Houdin, the great French Conjurer and clock maker, who was also known as the Father of Modern Magic, though that title should probably updated to the Father of Modern Victorian Magic. The new Invisibility Machine will hopefully be ready and in the show. This is a very clever and unique take on a well known routine. But my routine and concept takes it into a whole new direction for which I am quite thrilled to do. My Mustache Gallery routine will be in the show also. This is a fun comedy magic effect loosely based on an idea by Karrel Fox. I have a feeling it's going to play especially strong in the summer programs. With any luck I will have a new story routine in the show. It's all written, now it's just a matter of getting the props ready. It's a story about a relative who shined shoes when he first came to America to make money. It's a heart warming story and has a nice moment of magic, with a surprise kicker ending.